The beauty of the Briggs & Stratton 206 engine program is stability. 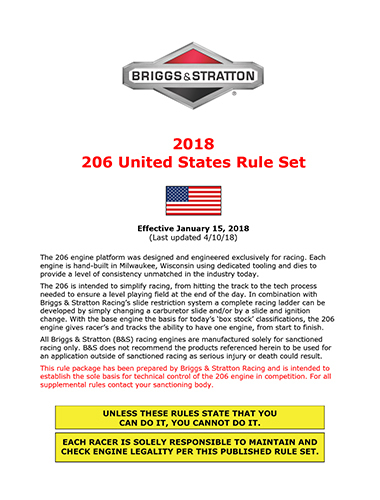 The official 2015 (2018) Briggs & Stratton 206 rule set is now available online at www.BriggsRacing.com. “If you have the first-ever 206 engine built in the Fall of 2008 you can still win a Championship just as you can with the engine we have yet to build” stated David Klaus, Director – Briggs & Stratton Racing. “Combining the simplicity of out of the box, competitive racing with the long-term stability and reliability of an engine which is engineered for racing defines what the 206 program is all about. Imagine the engine changes our sport has seen in the last 9 years. Our interest as racers, as a company in racing is to bring stability and promote great racing, not stoke rule changes or designed obsolescence to drive sales.